The Peak District is an upland area in England at the southern end of the Pennines. It is mostly in northern Derbyshire, but also includes parts of Cheshire, Greater Manchester, Staffordshire, West Yorkshire and South Yorkshire. An area of great diversity, it is split into the Dark Peak, where most of the moorland is found and the geology is gritstone, and the limestone area of the White Peak. The Peak District National Park became the first national park in the United Kingdom in 1951. With its proximity to the cities of Manchester, Stoke-on-Trent, Derby and Sheffield, and access by road and rail, it attracts millions of visitors every year. Inhabited from the Mesolithic era, evidence exits from the Neolithic, Bronze and Iron Ages. Settled by the Romans and Anglo-Saxons, the area remained largely agricultural and mining grew in importance in the medieval era. Richard Arkwright built his cotton mills at the start of the Industrial Revolution. Quarrying became important as mining declined. Tourism grew after the advent of the railways, visitors attracted by the landscape, spa towns at Buxton and Matlock Bath, Castleton's show caves, and Bakewell, the national park's only town. Tourism remains important for its towns and villages and their varied attractions, country houses and heritage sites. Outside the towns, walking on the extensive network of public footpaths, cycle trails, rock climbing and caving are popular pursuits. The Peak District is at the southern end of the Pennines and much of the area is upland above 1,000 feet (300 m). Its high point is Kinder Scout at 2,087 ft (636 m). Despite its name, the landscape generally lacks sharp peaks, and is characterised mostly by rounded hills, plateaus, valleys, limestone gorges and gritstone escarpments (the "edges"). The area, mostly rural, is surrounded by conurbations and large urban areas including Manchester, Huddersfield, Sheffield, Derby and Stoke-on-Trent. The national park has a formal boundary, but the wider Peak District is less well defined. The Dark Peak is largely uninhabited moorland and gritstone escarpments in the north of the Peak District and its eastern and western margins. It encloses the central and southern White Peak which is where most settlements, farmland and limestone gorges are located. Three of Natural England's National Character Areas (NCAs) include the landscape. They cover areas mostly inside the national park, with one including the northern and eastern parts of the Dark Peak and another including the White Peak. The western margins of the Dark Peak are in the South West Peak NCA, where farmland and pastured valleys are found as well as gritstone edges and moorland. 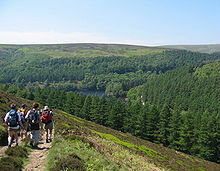 Outside the park, some of the outer fringes and foothills are considered to be part of the Peak District, including the Churnet and lower Derwent Valleys. The region is mostly surrounded by lowlands with gritstone moorlands of the South Pennines to the north. The national park covers 555 square miles (1,440 km2), including most of the region in Derbyshire and extends into Staffordshire, Cheshire, Greater Manchester and South and West Yorkshire. The park's northern limits are on the A62 road between Huddersfield and Oldham, and its southernmost point is on the A52 road near Ashbourne. The park boundaries were drawn to exclude built-up and industrial areas; in particular Buxton and the quarries at the end of the Peak Dale corridor are surrounded on three sides by the park. Bakewell and many villages are in the national park as is much of the rural west of Sheffield. 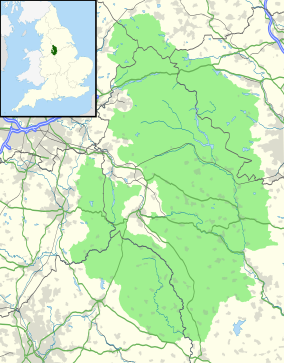 As of 2010, it is the fifth largest national park in England and Wales. In the UK, designation as a national park means that planning and other functions are provided by a national park authority with additional planning restrictions that provide enhanced protection against inappropriate development. Land within this national park as in other UK parks is in a mix of public and private ownership. The National Trust, a charity that conserves historic and natural landscapes, owns about 12% of the land in the national park. Its three estates (High Peak, White Peak and Longshaw) include ecologically or geologically significant areas at Bleaklow, Derwent Edge, Hope Woodlands, Kinder Scout, the Manifold valley, Mam Tor, Dovedale, Milldale and Winnats Pass. The park authority owns around 5%, and other major landowners include several water companies. A High Peak panorama between Hayfield and Chinley. Bakewell is the largest settlement and only town in the national park; its five-arched bridge over the River Wye dates from the 13th century. Castleton is the centre of production of the semi-precious mineral Blue John while the village of Eyam is known for its self-imposed quarantine during the Black Death. Edale is the southern terminus of the Pennine Way, and is sometimes considered to be the southern end of the Pennines. Other villages within the park include Flash, Hathersage, Hartington, Ilam and Tideswell. The towns of Glossop, Chapel-en-le-Frith, Buxton, Macclesfield, Leek, Ashbourne, Matlock and Chesterfield are on the fringes of the national park. The spa town of Buxton was developed by the Dukes of Devonshire as a genteel health resort in the 18th century while the spa at Matlock Bath in the valley of the River Derwent was popularised in the Victorian era. Hayfield is at the foot of Kinder Scout, the highest summit in the area. Other towns and villages fringing the park include Whaley Bridge, Hadfield, Marsden, Holmfirth, Stocksbridge, Darley Dale and Wirksworth. Within ten or twelve miles of Manchester, and six or seven miles from the existing reservoirs at Gorton, there is this tract of mountain land abounding with springs of the purest quality. Its physical and geological features offer such peculiar features for the collection, storage and supply of water for the use of the towns in the plains below that I am surprised that they have been overlooked. The western side of the Peak District is drained by the Etherow, Goyt, and Tame, which are tributaries of the River Mersey. The north east is drained by tributaries of the River Don. Of the tributaries of the River Trent that drain the south and east, the River Derwent is the most prominent. It rises on Bleaklow just east of Glossop and flows through the Upper Derwent Valley where it is constrained by the Howden, Derwent and Ladybower Reservoirs. The reservoirs of the Upper Derwent Valley were built from the early to mid 20th century to supply drinking water to the East Midlands and South Yorkshire. The River Noe and the River Wye are its tributaries. The River Manifold and River Dove in the south west, whose sources are on Axe Edge Moor, flow into the Trent, while the River Dane flows into the River Weaver in Cheshire. The Bugsworth Basin on the Peak Forest Canal. There are no canals in the national park, although the Standedge Tunnels on the Huddersfield Narrow Canal run underneath the extreme north of it. Waters from the Dark Peak feed the Macclesfield, Ashton, and Huddersfield Narrow Canals and waters from the White Peak fed the Cromford Canal. Outside the park, the Peak Forest Canal brought lime from the quarries at Dove Holes for the construction industry. It terminated at Bugsworth Basin and the journey was completed using the Peak Forest Tramway. The Cromford Canal, from Cromford to the Erewash Canal, served lead mines at Wirksworth and Sir Richard Arkwright's cotton mills. The Caldon Canal from Froghall was built to transport limestone from quarries at Cauldon Low for the iron industry and flints for the pottery industry. Most of the area is more than 1,000 feet (300 m) above sea level, in the centre of the country at a latitude of 53°N resulting in relatively high annual rainfall, averaging 40.35 inches (1,025 mm) in 1999, compared with the rest of England and Wales. The Dark Peak tends to receive more rainfall then the White Peak as it is higher. The higher rainfall does not affect the temperature, which averages the same as the rest of England and Wales at 10.3 °C (50.5 °F). During the 1970s, the Dark Peak regularly recorded more than 70 days of snowfall. Since then the number of snowfall days has decreased. The hills still see periods of long continuous snow cover in some winters. Snow in mid-December 2009 on some hill summits created snow patches that lasted in some cases until May 2010. In the same winter, the A635 (Saddleworth Moor) and A57 (Snake Pass) were closed because of lying snow for almost a month. Frost cover is seen for 20–30% of the winter on moorland in the Dark Peak and 10% in the White Peak. The Moorland Indicators of Climate Change Initiative was set up in 2008 to collect data in the area. Students investigated the interaction between people and the moorlands, and their effect on climate change, to discover whether the moorlands are a net carbon sink or source, based on the fact that Britain's upland areas are a significant global carbon store in the form of peat. Human interaction in terms of direct erosion and fire as well as the effects of global warming are the major variables that they considered. The Peak is formed almost exclusively from sedimentary rocks dating from the Carboniferous period. They comprise the Carboniferous Limestone, overlying Gritstone and the Coal Measures which occur only on the extreme margins and infrequent outcrops of igneous rocks including lavas, tuffs and volcanic vent agglomerates. The general geological structure is that of a broad dome, whose western margins have been most intensely faulted and folded. Uplift and erosion have effectively sliced the top off the dome to reveal a concentric outcrop pattern with Coal Measures rocks on the eastern and western margins, Carboniferous Limestone at the core and with rocks of Millstone Grit outcropping between them. The southern edge of the dome is overlain by sandstones of Triassic age though they barely impinge on the National Park. The White Peak is the central and southern section where Carboniferous Limestone is found at or near the surface. The Dark Peak to the north, east and west is characterised by Millstone Grit outcrops and broad swathes of moorland. Earth movements after the Carboniferous period resulted in the up-doming of the area and, particularly in the west, the folding of the rock strata along north–south axes. The region was raised in a north–south line which resulted in the dome-like shape and the shales and sandstones were worn away until limestone was exposed. At the end of this period, the Earth's crust sank here which led to the area being covered by sea, depositing a variety of new rocks. Some time after its deposition, mineral veins were formed in the limestone. The veins and rakes have been mined for lead since Roman times. The Peak District was covered by ice during at least one of the ice ages of the last 2 million years (probably the Anglian glaciation of around 450,000 years ago) as evidenced by the patches of glacial till or boulder clay that can be found across the area. It was not covered by ice during the last glacial period, which peaked around 20,000–22,000 years ago. A mix of Irish Sea and Lake District ice abutted against its western margins. Glacial meltwaters eroded a complex of sinuous channels along this margin of the district during this period. Glacial meltwaters contributed to the formation and development of many caves in the limestone area. Wild animal herds roamed the area, and their remains have been found in several of the local caves. The different types of rock beneath the soil strongly influence the landscape; they determine the type of vegetation that will grow, and ultimately the type of animal that will inhabit the area. Limestone has fissures and is soluble in water, therefore rivers have been able to carve deep, narrow valleys. The rivers then often find routes underground, creating cave systems. Millstone Grit is insoluble but porous, absorbing water which seeps through the grits, until it meets the less porous shales beneath, creating springs where it reaches the surface. The shales are friable and easily attacked by frost and form areas that are vulnerable to landslides, as on Mam Tor. The gritstone and shale of the Dark Peak supports heather moorland and blanket bog environments, with rough sheep pasture and grouse shooting being the main land uses, although parts of it also support farming, especially the South West Peak NCA. The limestone plateaux of the White Peak are more intensively farmed, with mainly dairy usage of improved pastures. Woodland forms around 8% of the Peak National Park. Natural broad-leaved woodland is found in the steep-sided, narrow dales of the White Peak and the deep cloughs of the Dark Peak, while reservoir margins often have coniferous plantations. Jacob's-ladder (Polemonium caeruleum), a relatively rare species characteristic of limestone dales in the White Peak, has been the county flower of Derbyshire since 2002. It grows in grassland, light woodland, on screes, rock ledges and by streams in Lathkill, Wolfscote, Taddington, Wye Dale and other dales. Pollen evidence from peat bogs indicates that it was widespread throughout Britain just after the last ice-age. Much planted in gardens from where it has established itself in other parts of the area, as a native it is restricted to the White Peak and the Yorkshire Dales. Three endemic vascular plants are found nowhere else in the world: Rubus durescens is a bramble found in central Derbyshire; Derby hawkweed (Hieracium naviense), found only in Winnats Pass, is a native perennial of limestone cliffs that was discovered by J.N. Mills in 1966 and described as a new species in 1968; and leek-coloured hawkweed (H. subprasinifolium) was believed extinct but was rediscovered on banks beside the Monsal Trail in Cheedale in 2017. The endemic Derbyshire feather moss Thamnobryum angustifolium occurs in one Derbyshire limestone dale, its sole world location intentionally kept confidential; the colony covers about 3 square metres (32 sq ft) of a rock face with small subsidiary colonies nearby. The Dark Peak's heathlands, bogs, gritstone edges and acid grasslands contain relatively few species and heather (Calluna vulgaris), crowberry (Empetrum nigrum), bilberry (Vaccinium myrtillus) and hare's-tail cotton grass (Eriophorum vaginatum) are dominant on the high moors. White Peak habitats include calcareous grassland, ash woodlands and rock outcrops suitable for lime-loving species. They include early purple orchid (Orchis mascula), dark-red helleborine (Epipactis atrorubens) and fly orchid (Ophrys insectifera)), common rockrose (Helianthemum nummularium), spring cinquefoil (Helianthemum nummularium) and grass of parnassus (Parnassia palustris). Lead rakes, the spoil heaps of ancient mining activity, form another distinctive habitat in the White Peak, supporting a range of rare metallophyte plants, including the spring sandwort (Minuartia verna; also known as leadwort), alpine pennycress (Thlaspi caerulescens) and mountain pansy (Viola lutea). Most mammals found in the Peak District are generalists and widespread across the UK, but mountain hares on heather moorland in the Dark Peak constitute the only wild population in England. They were re-introduced in the Victorian era for sporting purposes. A feral population of red-necked wallabies lived around The Roaches from the 1940s onwards but may now be extinct. Red deer herds, assumed to be derived from animals escaped from deer parks at Lyme Park and Chatsworth, are established in the upper reaches of the Goyt valley and on the moors above Baslow, and a herd on Wharncliffe Crags outside the park north of Sheffield may derive from the hunting stock of Wharncliffe Chase. Biodiversity action plans have been prepared for mountain hare, brown hare, brown long-eared bat, dormouse, harvest mouse, hedgehog, noctule bat, otter, pine marten, polecat, soprano pipistrelle and water vole. The status of the pine marten is unclear, although confirmed sightings have occurred in recent decades in Derbyshire and north Staffordshire and a specimen from an introduced Welsh population was found dead outside the national park on a road between Ripley and Belper in 2018. Many of the Peak's bird species are also widespread generalists. The moors of the Dark Peak support breeding populations of a number of upland specialists, such as twite, short-eared owl, golden plover, dunlin, ring ouzel, northern wheatear and merlin. The populations of twite and golden plover are the southernmost confirmed breeding populations in England, and the Peak District Moors Special Protection Area (SPA) is a European designation for its populations of merlin, golden plover and short-eared owl. The Peak District lacks the concentrations of breeding waders found further north in the Pennines, although the moors and their fringes accommodate breeding curlew and lapwing as well as less noticeable wading birds including dunlin and snipe. Commercial driven grouse shooting occurs on the heather moorlands of the Dark Peak, where the red grouse population is maintained by gamekeepers employed by shooting estates. A population of black grouse became extinct in 2000, but reintroduction was attempted in 2003. Quarries and rock outcrops provide nest sites for peregrine falcon and common raven. Ravens and common buzzards are increasingly encountered as their British range expands eastwards, perhaps because of general reductions in persecution. Illegal persecution may be implicated in the limited populations of rare raptors such as northern goshawk, peregrine and hen harrier. Following the RSPB's publication of Peak Malpractice, a 2006 report highlighting wildlife crime, the Peak District Bird of Prey Initiative was set up in 2011 by conservationists and shooting bodies in an attempt to boost the populations of birds of prey. The park authorities expressed disappointment at the limited results and the RSPB withdrew from the partnership in January 2018. Fast-flowing rivers attract specialist species, notably grey wagtail, dipper, common sandpiper, mandarin duck and goosander. Wooded and semi-wooded areas attract redstart, pied flycatcher, wood warbler and tree pipit, and coniferous plantations house siskin and common crossbill. Upland reservoirs in the Dark Peak are generally oligotrophic and attract few birds, but lower-lying reservoirs on the southern fringes such as Carsington Water and Ogston Reservoir regularly attract rare migrants and wintering rarities such as various waders, wildfowl, gulls and terns. The area is regularly overflown by wintering populations of pink-footed geese moving between East Anglia and Morecambe Bay. Dipper, golden plover, hen harrier, merlin and short-eared owl are local biodiversity action plan priority species. Amphibians and reptiles such as common lizards, grass snakes, great crested newts and slow worms are found in the area. The eastern moors are a stronghold for adders. Native fish in the Peak District include Atlantic salmon, brown trout, European eel, bullhead, brook lamprey and grayling. A possibly unique population of "wild" rainbow trout survives on the Derbyshire Wye, following their introduction at the turn of the 20th century. Butterflies in the region include the dingy skipper, brown argus, small blue and white-letter hairstreak. Moths include the anomalous, broom moth, dot moth, garden dart, mouse moth and white ermine. Other invertebrates include the bilberry bumblebee, broad groove-head spider, mole cricket, northern yellow splinter, shining guest ant, violet oil beetle and white-clawed crayfish. A view of the Edale valley from Mam Tor. The Peak has been inhabited from the earliest periods of human activity as evidenced by finds of Mesolithic flint artefacts and palaeoenvironmental evidence from caves in Dovedale and elsewhere. Evidence of Neolithic activity includes monumental earthworks or barrows such as that at Margery Hill. In the Bronze Age the area was well populated and farmed, and evidence of these people survives in henges such as Arbor Low near Youlgreave, or the Nine Ladies stone circle at Stanton Moor. In the same period, and into the Iron Age hillforts such as that at Mam Tor were created. The Romans exploited the area's rich mineral veins, exporting lead from the Buxton area along well-used routes. Buxton was a Roman settlement, known as "Aquae Arnemetiae" in recognition of its spring. .
Theories as to the derivation of the Peak name include that it came from the Pecsaetan or peaklanders, an Anglo-Saxon tribe who inhabited the central and northern parts of the area from the 6th century AD when it was part of the Anglian kingdom of Mercia. Barrows from the Anglo-Saxon period are present, including at Benty Grange, where the eponymous helmet was found. ... craggy hills whose bowells are full of mines of all kinds off black and white and veined marbles, and some have mines of copper, others tinn and leaden mines, in w[hi]ch is a great deale of silver. Coal measures occur on the Peak's western and eastern fringes and evidence of past workings can be found from Glossop to The Roaches, and from Stocksbridge to Baslow. The coal measures in the east are at the western edge of the South Yorkshire Coalfield and those in the west are part of the Cheshire section of the Lancashire Coalfield. Mining started in medieval times and was at its most productive in the 18th and early 19th centuries and continued into the early 20th century. The earliest mining took place at and close to outcrops where miners followed the seams deeper into the hillsides. At Goyt's Moss and Axe Edge, deep seams were worked and steam engines raised the coal and dewatered the mines. Coal from the east was used in lead smelting and from the west for lime burning. Lead mining peaked in the 17th and 18th centuries; high concentrations were found in the area from this period, as well as discovering peat on Kinder Scout suggesting that lead smelting occurred. Lead mining declined from the mid-19th century and the last major mine closed in 1939. Lead is a by-product of fluorite, baryte and calcite mining. Bell pits were sunk to access ore that lay close to the surface. Fluorite or fluorspar is called Blue John locally, its name possibly from the French bleu et jaune describing its colour. Blue John is scarce, and now only a few hundred kilograms are mined each year for ornamental and lapidary use. The Blue John Cavern in Castleton is a show cave. Small scale mining takes place in Treak Cliff Cavern. Industrial limestone quarrying to make soda ash started around Buxton in 1874. In 1926 the operation became part of ICI. Large-scale limestone and gritstone quarrying flourished as lead mining declined, and is an important if contentious industry. Of the twelve large limestone quarries in operation, Tunstead is one of the largest in Europe. Total limestone output was substantial: at the 1990 peak, 8.5 million tonnes was produced. Textiles have been exported for hundreds of years. In the 14th century, the area traded in unprocessed wool. There was a number of skilled hand spinners and weavers in the area. By the 1780s, Richard Arkwright had developed machinery to produce textiles more quickly and to a higher standard. The early Arkwright mills were of light construction, narrow, about 9 feet (2.7 m) wide, and low, the ceiling height was only 6 to 8 feet (1.8 to 2.4 m) and were lit by daylight. The new machines were powered by water wheels. The Peak was the ideal location, with its rivers and humid atmosphere. The local pool of labour was quickly exhausted and Litton Mill and Cressbrook Mill in Millers Dale brought in children as young as four from the workhouses of London as apprentices. As technology advanced, narrow valleys proved unsuitable for larger steam-driven mills, but the Derbyshire mills remained, trading in finishing and niche products. Glossop benefitted from the textile industry. Its economy was linked closely with a spinning and weaving tradition that had evolved from developments in textile manufacture during the Industrial Revolution. Until the First World War, Glossop had the headquarters of the largest textile printworks in the world but after the Wall Street crash, its product lines became vulnerable and the industry declined. The Kinder Trespass in 1932 was a landmark in the campaign for open access to moorland in Britain and eventually led to the formation of Britain's national parks. Before the trespass, open moorland was closed to all. Moorland estates were the private property of landed gentry who used them for only 12 days a year and were guarded by their gamekeepers. The Peak District National Park became the United Kingdom's first national park on 17 April 1951. Campaigner Ethel Haythornthwaite played an important part in the development of the national park. The first long-distance footpath in the United Kingdom was the Pennine Way, which opened in 1965 and starts at the Nags Head Inn, in Grindsbook Booth, part of Edale village. Saddleworth Moor and Wessenden, above Meltham, gained notoriety after the Moors murders in the 1960s. Tourism is estimated to provide 500 full-time jobs, 350 part-time jobs and 100 seasonal jobs. It is a major source of employment for park residents (24%). Manufacturing industries (19%), quarrying (12%) and agriculture (12%) are also important. The cement works at Hope is the largest single employer in the park. Limestone is the most important mineral quarried, mainly for roads and cement; shale is extracted for cement at Hope, and several gritstone quarries are worked for building stone. Lead mining is no longer economic, but fluorite, baryte and calcite are extracted from lead veins, and small-scale Blue John mining occurs at Castleton. The springs at Buxton and Ashbourne are exploited to produce bottled mineral water, and many plantations are managed for timber. Other manufacturing industries include David Mellor's cutlery factory in Hathersage, Ferodo brake linings in Chapel-en-le-Frith and electronic equipment in Castleton. Of the approximately 2,700 farms in the national park, most covering less than 40 hectares (99 acres), 60% of farms are run on a part-time basis where the farmer has a second job. De Mirabilibus Pecci or The Seven Wonders of the Peak by Thomas Hobbes was an early tourist description published in 1636. Much scorn was poured on the seven wonders by visitors, including Daniel Defoe who described the moors by Chatsworth as "a waste and houling wilderness" and was particularly contemptuous of Peak Cavern near Castleton which was known as the 'Devil's Arse'. Visitor numbers did not increase until the Victorian era when the advent of railways provided access and a cultural appreciation of the Picturesque and Romantic developed. John Mawe's Mineralogy of Derbyshire (1802) and William Adam's Gem of the Peak (1843) generated interest in the area's unique geology. A tradition of public access and outdoor recreation grew in the area which is natural hinterland and rural escape for the populations of industrial Manchester and Sheffield, and remains a valuable leisure resource in a largely post-industrial economy. In a 2005 survey of visitors, 85% of respondents mentioned "scenery and landscape" as a reason for visiting. Buxton developed as a spa town because of its geothermal spring which rises at a constant temperature of 28 °C. It was settled by the Romans around AD 78, when it was known as Aquae Arnemetiae, or the spa of the goddess of the grove. Bess of Hardwick and her husband the Earl of Shrewsbury, "took the waters" in 1569, and brought Mary, Queen of Scots, there in 1573. The town largely grew in importance in the late 18th century when it was developed by the 5th Duke of Devonshire in style of the spa of Bath. A resurgence in the Victorian era attracted Dr Erasmus Darwin and Josiah Wedgwood, who were drawn by the reputed healing properties of the waters. The railway reached Buxton in 1863. Buxton's notable buildings are The Crescent (1780–1784), modelled on Bath's Royal Crescent, by John Carr, The Devonshire (1780–1789), The Natural Baths, and The Pump Room by Henry Currey. The Pavilion Gardens were opened in 1871. Buxton Opera House was designed by Frank Matcham in 1903. 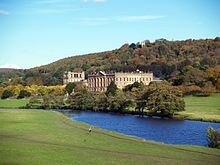 Historic buildings in the park include Chatsworth House, seat of the Dukes of Devonshire and among Britain's finest stately homes; the medieval Haddon Hall, seat of the Dukes of Rutland; and Lyme Park, an Elizabethan manor house transformed by an Italianate front. Other historic buildings in the park include Eyam Hall, Ilam Hall and Tissington Hall. Many villages and towns have fine parish churches, including the 14th-century Church of St John the Baptist at Tideswell, sometimes dubbed the 'Cathedral of the Peak', and the 12th-century Church of St Nicholas at High Bradfield. 'Little John's Grave' is in the churchyard at Hathersage. Peveril Castle, overlooking Castleton, was built by the Normans. Inside the park, Eyam Museum has displays about the village's history during the Black Death. Castleton has four show caves; Peak Cavern, Blue John, Treak Cliff and Speedwell. In the outer fringes, the area's industrial heritage is represented by the mining museum at Matlock Bath with the Temple Lead Mine, the Derwent Valley Mills World Heritage Site and Brindley Water Mill at Leek. Preserved railways such as the Peak Rail, Ecclesbourne Valley and Churnet Valley lines, the National Tramway Museum at Crich and the Cromford Canal chart the area's transport history. Matlock Bath also has the Life in a Lens Museum of Photography & Old Times, presenting the history of photography from 1839, the show caves and mines of the Heights of Abraham which can be reached by cable car, and the Gulliver's Kingdom theme park. Buxton has an opera house and theatre, museum and art gallery and Poole's Cavern show cave. Other attractions in the fringes include the Alton Towers theme park and the Peak Wildlife Park. A well dressing at Hayfield. 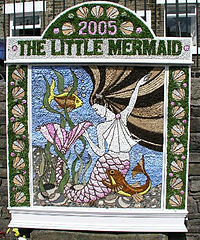 Well dressing ceremonies are held in many villages during the spring and summer months, a tradition said to date from pagan times. Other local customs include Castleton Garland Day and Ashbourne's Royal Shrovetide Football, played annually since the 12th century. Buxton hosts two opera festivals, the Buxton Festival and the International Gilbert and Sullivan Festival, and the Buxton Festival Fringe, and the Peak Literary Festival is held at various locations twice a year. Peak District food specialities include the dessert Bakewell pudding, very different from the nationally available Bakewell tart, and until 2009 the famous cheese Stilton and other local cheeses were produced in the village of Hartington. An extensive network of public footpaths and numerous long-distance trails, over 1,800 miles (2,900 km) in total, and large open-access areas are available for hillwalking and hiking. The Pennine Way traverses the Dark Peak from Edale to the park's northern boundary just south of Standedge. Bridleways are used by mountain bikers, as well as horse riders. The Tissington Trail and High Peak Trail which re-use former railway lines are well used by walkers, horse riders and cyclists. Sections of the former rail routes were converted to multi-purpose cycle trails. After the Woodhead Line was closed between Hadfield and Penistone part of the trackbed was used for the Longdendale Trail section of the Trans Pennine Trail between Hadfield and Woodhead. The Manchester, Buxton, Matlock and Midlands Junction Railway between Rowsley and Buxton is part of the Monsal Trail. The trackbed of the Cromford and High Peak Railway is open to the public as the High Peak Trail. The Tissington Trail uses another disused rail line between Buxton and Ashbourne. Local authorities run cycle hire centres at Ashbourne, Parsley Hay, Middleton Top and the Upper Derwent Valley. Wheelchair access is possible at several places on the former railway trails, and cycle hire centres offer vehicles adapted to wheelchair users. A project to make footpaths more accessible to less-agile walkers has replaced stiles with gates. Gritstone outcrops at Stanage Edge and The Roaches, are recognised as some of the finest rock climbing sites in the world. Limestone is more unstable but provides many testing climbs. Thor's Cave was explored in the early 1950s by Joe Brown and others. Eleven limestone routes there are listed by the BMC, ranging in grade from Very Severe to E7, and several more have been claimed since the guidebook's publication; a few routes are bolted. 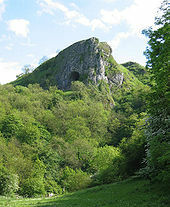 Caving takes place in the natural caves, potholes and old mine workings found in the limestone of the White Peak. Peak Cavern, the largest and most important cave system, is even linked to the Speedwell system at Winnats. The largest potholes are Eldon Hole and Nettle Pot. Many old mine workings were often extensions of natural cave systems. They can be found at Castleton, Winnats, Matlock, Stoney Middleton, Eyam, Monyash and Buxton. Reservoirs such as Torside Reservoir, Damflask Reservoir, Carsington Water and Rudyard Lake are centres for water sports, including sailing, fishing and canoeing. Other activities include air sports such as hang gliding and paragliding, birdwatching, fell running, off-roading, and orienteering. The first roads constructed by the Romans may have followed existing tracks. The Roman network linked the settlements and forts of Aquae Arnemetiae (Buxton), Chesterfield, Ardotalia (Glossop) and Navio (Brough and Shatton), and beyond. Parts of the modern A515 and A53 roads south of Buxton are believed to follow the routes of Roman roads. Packhorse routes criss-crossed the Peak in the Medieval era, and some paved causeways such as the Long Causeway along Stanage Edge date from this period. No highways were marked on Christopher Saxton's 1579 map of Derbyshire. Bridge-building improved the transport network. Although the introduction of turnpike roads from 1731 reduced journey times, the journey from Sheffield to Manchester in 1800 still took 16 hours prompting Samuel Taylor Coleridge to remark that "a tortoise could outgallop us!" From around 1815, better quality turnpike roads were built. The Snake Pass, part of the A57, was built under the direction of Thomas Telford in 1819–21. The main roads are the A57 between Sheffield and Manchester, the A628, Woodhead Pass, between Barnsley and Manchester via Longdendale, the A6 from Derby to Manchester via Buxton, the Cat and Fiddle Road from Macclesfield to Buxton, and in the north, the A635 from Manchester to Barnsley. Roads and lanes are frequently congested and the availability of parking spaces in towns and villages is a significant problem, especially during summer. A congestion charge was proposed in 2005, but was rejected. The Cromford Canal opened in 1794, to carry coal, lead and iron ore to the Erewash Canal, it was abandoned in 1944. The canal turnpike roads had to compete with railways after 1825. 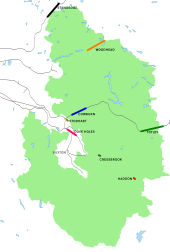 The first railway, the Cromford and High Peak Railway from High Peak Junction to Whaley Bridge, was an industrial line, but passenger services followed, including the Woodhead Line (Sheffield to Manchester via Longdendale) and the Manchester, Buxton, Matlock and Midlands Junction Railway. Several rail lines were closed in the 1960s as a result of the Beeching Axe. Totley Tunnel on the Manchester to Sheffield line. The Peak District is accessible by public transport. Train services operate along the Hope Valley line between Sheffield and Manchester, the Derwent Valley line between Derby and Matlock, the Buxton and Glossop lines, linking them to Manchester, and the Huddersfield line from Manchester to Huddersfield. Coach services provide access to Matlock, Bakewell and Buxton from Derby, Nottingham and Manchester through TransPeak and National Express, and there are regular buses from Sheffield, Glossop, Stoke, Leek and Chesterfield. The nearest airports are Manchester, Doncaster Sheffield, and East Midlands. In rural areas, villages are served by internal transport links. Minibuses operate from the towns to smaller villages. The Hope Valley and Buxton Line trains serve stations at Hathersage, Hope and Edale. Cycle England invested £1.25 million to build and improve cycle routes in the national park for leisure and commuting. Walkers above the Derwent Reservoir. The proximity of the Peak to major conurbations and urban areas (an estimated 20 million people live within an hour's drive) poses challenges for managing the area. The park authority, the National Trust and other landowners attempt to keep the upland landscape accessible for recreation while protecting it from intensive farming, erosion and pressure from visitors. Tension exists between the needs of the 38,000 residents, the needs of the millions of people who visit, and conservation requirements. The uneven distribution of visitors creates stresses. Dovedale alone receives about two million visitors annually. Other highly visited areas include Bakewell, Castleton and the Hope Valley, Chatsworth, Hartington and the reservoirs of the Upper Derwent Valley. More than 60% of visits take place between May and September, with Sunday the busiest day. Footpath users in the more popular walking areas have contributed to serious erosion problems, particularly on the fragile peat moorlands. The use of some paths by mountain bikers is believed to have exacerbated the problem. Measures to contain the damage include the diversion of the official route of the Pennine Way out of Edale, which now goes via Jacob's Ladder rather than following the Grindsbrook, and surfacing moorland footpaths with expensive natural stone paving. Some rights of way have been damaged by legal and illegal use by off-road vehicles such as 4×4s and trail bikes. Campaigners have sought to reduce their impact. Large-scale limestone quarrying is contentious. Most mineral extraction licences were issued by national government for 90 years in the 1950s and remain legally binding. The park authority has a policy of considering applications for new quarries and licence renewal in the park in terms of the local and national need for the mineral and how unique the source is, in conjunction with the effects on traffic, residents and the environment. 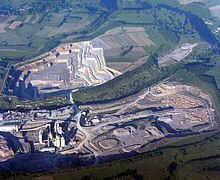 Some licences have not been renewed; the RMC Aggregates quarry at Eldon Hill closed in 1999 and landscaped. Proposals from Stancliffe Stone Ltd to re-open dormant gritstone quarries at Stanton Moor in 1999 became a test case, hotly contested by ecological protesters and residents on the grounds that the development would threaten Bronze Age remains at the Nine Ladies Stone Circle, and damage the natural landscape. In 2007, negotiations took place to relocate the development to Dale View quarry in a less sensitive area. The landscapes of the Peak have inspired writers for centuries. Various places have been identified by Ralph Elliott and others as locations in the 14th-century poem Sir Gawain and the Green Knight; Lud's Church is thought to be the Green Chapel. Chatsworth House – The setting for a recent adaptation of Pride and Prejudice. Key scenes in Jane Austen's 1813 novel Pride and Prejudice are set in the Peak . Peveril of the Peak (1823) by Sir Walter Scott is a historical novel set at Peveril Castle, Castleton during the reign of Charles II. William Wordsworth was a frequent visitor to Matlock; the Peak inspired several of his poems, including an 1830 sonnet to Chatsworth House. The village of Morton in Charlotte Brontë's 1847 novel Jane Eyre is based on Hathersage, where Brontë stayed in 1845, and Thornfield Hall might have been inspired by nearby North Lees Hall. Snowfield in George Eliot's first novel Adam Bede (1859) is believed to be based on Wirksworth, where her uncle managed a mill; Ellastone (as Hayslope) and Ashbourne (as Oakbourne) also feature. Beatrix Potter, the author of Peter Rabbit, visited her uncle Edmund Potter at his printworks in Dinting Vale. She copied cloth samples from his pattern book to dress her characters. Mrs Tiggywinkle's shawl, in The Tale of Mrs. Tiggy-Winkle, is based on pattern number 222714. Children's author Alison Uttley (1884–1976) was born at Cromford; her novel A Traveller in Time, set in Dethick, recounts the Babington Plot to free Mary, Queen of Scots, from imprisonment. Crichton Porteous (1901–91) set several books in locations in the Peak; Toad Hole, Lucky Columbell and Broken River are set in the Derwent Valley. Geraldine Brooks's first novel, Year of Wonders (2001), blends fact and fiction to tell the story of the plague village of Eyam. Eyam also inspired Children of Winter by children's novelist Berlie Doherty who has set several other works in the Peak, including Deep Secret, based on the drowning of the villages of Derwent and Ashopton by the Ladybower Reservoir, and Blue John, inspired by the cavern at Castleton. Many works of crime and horror have been set in the Peak. The Terror of Blue John Gap by Sir Arthur Conan Doyle (1859–1930) recounts terrible events at the Blue John mines, and Sherlock Holmes investigates the kidnapping of a child in The Adventure of the Priory School. Many horror stories by local author Robert Murray Gilchrist feature Peak settings. Stephen Booth has written a series of crime novels set in real and imagined Peak locations, while In Pursuit of the Proper Sinner, an Inspector Lynley mystery by Elizabeth George, is set on the fictional Calder Moor. Other writers and poets who lived in or visited the Peak include Samuel Johnson, William Congreve, Anna Seward, Jean-Jacques Rousseau, Lord Byron, Thomas Moore, Richard Furness, D. H. Lawrence, Vera Brittain, Richmal Crompton and Nat Gould. The landscapes and historic houses are popular settings for film and television. The classic 1955 film The Dam Busters was filmed at the Upper Derwent Valley reservoirs, where practice flights for the bombing raids on the Ruhr dams had been made during the Second World War. In adaptations of Pride and Prejudice, Longnor has featured as Lambton, and Lyme Park and Chatsworth House have stood in for Pemberley. Haddon Hall doubled as Thornfield Hall in two different adaptations of Jane Eyre and has appeared in several films including Elizabeth, The Princess Bride and The Other Boleyn Girl. The television medical drama Peak Practice set in the fictional village of Cardale was filmed in Crich, Matlock and other Peak locations. ^ "Peak District Local Government". Retrieved 8 November 2016. ^ "Quarrying and mineral extraction in the Peak District National Park" (PDF). Peak District National Park Authority. 2011. Archived from the original (PDF) on 27 January 2012. Retrieved 17 April 2012. ^ Wheeler, T. (2003). Else, D, ed. Britain (5th ed.). Lonely Planet. p. 42. ISBN 1-74059-338-3. The Peak District alone gets 20 million, making it Britain's most-visited park, and the second-busiest in the world. ^ "Media Centre Facts and Figures". Peak District National Park Authority. Retrieved 4 March 2014. ^ "Location and overview of the Peak District". Peak District National Park. Peak District National Park. Retrieved 5 August 2018. ^ Nuttall, J.; Nuttall, A. (1990). The Mountains of England & Wales – Volume 2: England. Milnthorpe: Cicerone. ISBN 1-85284-037-4. Retrieved 23 August 2009. ^ "Landscape". Peak District National Park State of the Park. Retrieved 28 June 2017. ^ "Gritstone Edges". Peak District Online. Retrieved 28 June 2017. ^ "Peak District". Heathrow Shuttle. Heathrow Shuttle. Retrieved 13 February 2018. ^ "Accommodation in Derbyshire and the Peak National Park". Discover Derbyshire and the Peak District. Discover Derbyshire and the Peak District. Retrieved 12 May 2018. ^ a b "Character areas". Peak District.gov. Archived from the original on 14 September 2017. Retrieved 14 September 2017. ^ a b "South West Peak". Scottish Natural Heritage. Scottish Natural Heritage. Retrieved 12 May 2018. ^ Britain. Martin Walters and Bob Gibbons. pp. 220–221. Retrieved 14 February 2018. ^ Slow Travel The Peak District. Helen Moat. pp. 200–203. Retrieved 5 October 2017. ^ "The Peak District". Peak District Online. Peak District Online. Retrieved 31 March 2018. ^ "NCA Profile: 36 Southern Pennines (NE323)". Natural England. Retrieved 14 September 2017. ^ "The Peak District National Park – Fact Zone". PDNP Education. 2000. Archived from the original on 8 March 2010. Retrieved 22 May 2009. ^ "National Park facts and figures". National Parks. 2009. Archived from the original on 11 January 2012. Retrieved 13 November 2013. ^ Handbook for Members and Visitors 2004, The National Trust. ^ "High Peak Estate". The National Trust. 2009. Archived from the original on 26 April 2009. Retrieved 22 May 2009. ^ a b "Ilam Park and South Peak Estate". The National Trust. 2010. Archived from the original on 15 July 2010. Retrieved 26 September 2010. ^ "Longshaw Estate". The National Trust. 2009. Archived from the original on 10 May 2009. Retrieved 22 May 2009. ^ a b "Peak District National Park Authority factsheets". Peak District National Park Authority. 2012. Retrieved 4 March 2014. ^ "Bakewell". Places-to-go.org.uk. 2003. Retrieved 18 June 2009. ^ "Mystery of the Black Death". Secrets of the Dead. Retrieved 18 June 2009. ^ Terry Marsh. "Great Mountain days in the Pennines". Retrieved 22 September 2017. ^ a b "Visit Buxton". VisitBuxton.co.uk. 2007. Retrieved 18 June 2009. ^ a b Quayle, Tom (2006). Manchester's Water: The Reservoirs in the Hills. Stroud: Tempus Publishing. p. 15. ISBN 0-7524-3198-6. ^ Bevan, Bill (2004). The Upper Derwent: 10,000 Years in a Peak District Valley. Stroud: Tempus Publishing. pp. 141–159. ISBN 0-7524-2903-5. ^ "River Derwent". Peak District Online. 2009. Retrieved 1 July 2009. ^ "The Manifold is a sister river to the Dove". Peak District Information. Cressbrook Multimedia. 2008. Retrieved 1 July 2009. ^ "The Dove is the major river of the South Peak". Peak District Information. Cressbrook Multimedia. 2008. Retrieved 1 July 2009. ^ "The Dane flows west into Cheshire". Peak District Information. Cressbrook Multimedia. 2008. Retrieved 1 July 2009. ^ "Caldon Canal". Canal River Trust. Canal River Trust. Retrieved 1 October 2017. ^ "Kinder Scout – the highest gritstone peak in the Peak District". Peak District Information. 2008. Retrieved 21 May 2009. ^ "Peak District Climate". Peak District National Park. 2003. Archived from the original on 23 May 2012. Retrieved 13 November 2013. ^ "About the Peak District ..." ThePeakDistrict.info. 2007. Retrieved 23 May 2009. ^ "Moorland Indicators of Climate Change Initiative 2012". Peak District. 2012. Archived from the original on 22 January 2012. Retrieved 3 April 2012. ^ a b "NCA Profile: 52 White Peak (NE534)". Natural England. Natural England. Retrieved 13 February 2018. ^ a b "NCA Profile: 51 Dark Peak (NE378)". Natural England. Natural England. Retrieved 13 February 2018. ^ a b Cope, F. W. (1976). Geology Explained in the Peak District. David & Charles. ISBN 0-7153-6945-8. ^ a b c "The Peak District is a very interesting area geologically". Peak District Information. Cressbrook Multimedia. 2008. Retrieved 24 May 2009. ^ Macdougall, D. (2006). The Geology of Britain. University of California Press. ISBN 0-520-24824-4. ^ Toghill, P. (2002). The Geology of Britain. Crowood Press. ISBN 1-84037-404-7. ^ "NCA Profile: 53 South West Peak (NE453)". Natural England. Natural England. Retrieved 26 September 2017. ^ a b c d e Willmott, Alan; Moyes, Nick. The Flora of Derbyshire. Pisces Publication. ISBN 978-1-874357-65-0. ^ "Polemonium caeruleum". Derby City Council. Derby City Council. Retrieved 25 April 2018. ^ Mills, J.N. (1968). "A new species of Hieracium in Derbyshire" (PDF). Watsonia. BSBI. 7 (1): 40–42. Retrieved 25 April 2018. ^ "Extinct plant rediscovered in the Peak District National Park". The Star. The Star. Retrieved 25 April 2018. ^ Hodgketts, Nick G. (March 2001). "Thamnobryum angustifolium: Derbyshire feather-moss" (PDF). Joint Nature Conservation Committee. Archived from the original (PDF) on 10 December 2015. Retrieved 2 October 2017. ^ a b "Biodiversity Action Plan – The Lead Legacy". Peak District. 2004. Archived from the original on 20 July 2011. Retrieved 13 November 2013. ^ "MOUNTAIN HARE Lepus timidus". Derbyshire Mammal Group. Retrieved 12 March 2018. ^ McCarthy, Michael (20 February 2013). "The decline and fall of the Peak District wallabies". The Independent. Retrieved 12 March 2018. ^ "Red Deer Cervus elaphus". Derbyshire Mammal Group. Retrieved 12 March 2018. ^ Hobson, Paul (12 November 2015). "The Red Deer of the Peak District - photograph special". Derbyshire Life. Retrieved 11 March 2018. ^ Rotherham, Ian D.; Rose, John C.; Percy, Chris (August 2012). "The dynamic influence of history and ecology on the restoration of a major urban heathland at Wharncliffe, South Yorkshire". In Rotherham, Ian D.; Handley, Christine. Wild by Design and Ploughing on Regardless: Landscape Archaeology and Ecology Special Series. Landscape Conservation Forum. Retrieved 12 March 2018. ^ a b c d e "Biodiversity Action Plan Species Found in the Peak District" (PDF). Peak District National Park. Peak District National Park. Retrieved 11 March 2018. ^ "PINE MARTEN Martes martes". Derbyshire Mammal Group. Retrieved 12 March 2018. ^ "Mystery of pine marten found dead '100 miles from home'". BBC. 28 August 2018. Retrieved 28 August 2018. ^ "Rare pine marten discovered in Derbyshire". Derbyshire Wildlife Trust. 24 August 2018. Retrieved 25 August 2018. ^ a b c d e f "Moorland Species". Peak District National Park. Retrieved 23 April 2018. ^ Dunning, Jamie; Frost, Roy; Christmas, Steve; Pearson, Mick (15 June 2016). "Notes on a neglected colony of Twite in central England". British Birds. Retrieved 23 April 2018. ^ "Short-eared Owl Asio flammeus". Derbyshire Wildlife Trust. Retrieved 23 April 2018. ^ O’Hara, Dave; Bird, Jon; Hanley, Kate; Carr, Geoff (8 February 2017). "Recovery of a breeding Dunlin population in the Peak District in response to blanket bog restoration". British Birds. Retrieved 23 April 2018. ^ a b c d e f "Where to find birds in the Peak District" (PDF). Peak Birds Project. Retrieved 23 April 2018. ^ a b Balmer, D.E. ; Gillings, S.; Caffrey, B.J. ; Swann, R.L. ; Downie, I.S. ; Fuller, R.J. (2013). Bird Atlas 2007–11: the breeding and wintering birds of Britain and Ireland. Thetford: BTO Books. ISBN 978-1-908581-28-0. ^ a b c d Marsland, Michael (1974). "Birds of the Peak District". Bird Study. 21 (2): 135–140. doi:10.1080/00063657409476409. Retrieved 23 April 2018. ^ a b c "Peak Malpractice: What's happening to wildlife in the Peak District National Park?" (PDF). RSPB. 2006. Retrieved 23 April 2018. ^ Capper, Matthew (21 March 2006). "Black Grouse in the Upper Derwent Valley – an Update". BirdGuides. Retrieved 23 April 2018. ^ "Peak District Bird of Prey Initiative – 2016 & 2017 Report" (PDF). Peak District Bird of Prey Initiative. 2018. Retrieved 26 April 2018. ^ "Peak District Bird of Prey Initiative". Peak District National Park. 25 January 2018. Retrieved 23 April 2018. ^ "RSPB ends involvement in failed Peak District Bird of Prey Initiative". RSPB. 23 January 2018. Retrieved 23 April 2018. ^ a b Evans, Lee G.R. (2009). The Ultimate Site Guide to Scarcer British Birds. BirdGuides. ISBN 1898110492. ^ "Breeding Bird Survey of the Peak District Moorlands:Moors for the Future Research Note No 1" (PDF). Moors for the Future. May 2005. Retrieved 23 April 2018. ^ a b c "Derbyshire Bird Report" (various). Derbyshire Ornithological Society. ^ Anderson, Penny (2016). "State of Nature in the Peak District" (PDF). Nature Peak District. Section 5.22. Retrieved 23 April 2018. ^ Whiteley, Derek (1997). Reptiles and Amphibians of the Sheffield Area and North Derbyshire (PDF). Sheffield: Sorby Natural History Society. Retrieved 23 April 2018. ^ "Rivers and Streams" (PDF). Peak District National Park. Peak District National Park. Retrieved 11 March 2018. ^ "Wild Rainbows of the River Wye, Derbyshire" (blog). The River Beat. 3 July 2012. Retrieved 22 August 2018. ^ "Rainbows: the pride of the river Wye". Derbyshire Times. 25 March 2009. Retrieved 22 August 2018. ^ "Margery Hill, South Yorkshire". English Heritage. 1994. Archived from the original on 12 October 2008. Retrieved 22 May 2009. ^ Bevan, Bill (2007). Ancient Peakland. Wellington: Halsgrove. ISBN 1-84114-593-9. ^ "Aquae Arnemetiae". RomanBritain.org. 2005. Retrieved 22 May 2009. ^ "Peak District history : Anglo Saxons to Present". Peakscan. Retrieved 28 June 2009. ^ Turbutt, G. (1999). A History of Derbyshire, Volume 1. Cardiff: Merton Priory. ISBN 1-898937-34-6. ^ Historic England. "Benty Grange hlaew, Monyash (1013767)". National Heritage List for England. Retrieved 10 February 2018. ^ Ford, T. D. (2002). Rocks and Scenery of the Peak District. Landmark Publishing. ISBN 1-84306-026-4. ^ Fiennes, C. (1888). Through England on a Side Saddle in the Time of William and Mary. London: Field and Tuer, The Leadenhall Press. Retrieved 22 May 2009. ^ "The Yorkshire Coalfield". The Friends of Hemingfield Colliery. Retrieved 17 September 2017. ^ "Manchester and Its Region". The University of Manchester. Retrieved 17 September 2017. ^ "Goyt's Moss and Axe Edge Moor Update" (PDF). Environment News 12. Archived from the original (PDF) on 26 July 2004. Retrieved 13 November 2013. ^ "Peak District Coal Mining". Peak District National Park. 2003. Archived from the original on 9 August 2010. Retrieved 13 November 2013. ^ a b "Mining in the Peak District of Derbyshire Lead and Copper Minerals". A Taste of the Peak District. Retrieved 24 June 2009. ^ "Blue John Stone". BlueJohnStone.co.uk. 2007. Retrieved 30 June 2009. ^ "The Buxton Story". Tarmac. 2006. Archived from the original on 5 May 2013. Retrieved 1 July 2009. ^ "Peak District industry". British Geological Survey. Retrieved 22 May 2009. ^ a b c d "Peak District National Park: Study Area". Peak District National Park. 2003. Archived from the original on 20 June 2005. Retrieved 22 May 2009. ^ "Textiles". Peakland Heritage. Archived from the original on 11 December 2007. Retrieved 23 May 2009. ^ Williams, M. (1992). Cotton Mills of Greater Manchester. Carnegie Publishing. p. 49. ISBN 0-948789-89-1. ^ "Children of the Revolution". Cotton Times. Archived from the original on 30 April 2009. Retrieved 31 March 2009. ^ Birch, A. H. (1959). "2". Small-Town Politics: A Study of Political Life in Glossop. Oxford University Press. pp. 8–38. ISBN 0-273-70161-4. ^ Renton, D. (23 February 2007). "Kinder Trespass: Context in 1932". The Kinder Trespass 75 organising committee. Archived from the original on 21 February 2009. Retrieved 28 June 2009. ^ a b Waugh, D. (2000). Geography An Integrated Approach (3rd ed.). Nelson Thornes. ISBN 0-17-444706-X. ^ a b "A place called home". Peak District. 2009. Archived from the original on 19 May 2009. Retrieved 22 May 2009. ^ "1678 – De Mirabilibus Pecci – Being the Wonders of the Peak in Darby-shire". British Library. Retrieved 22 May 2009. ^ Defoe, D. (1927). A tour thro' the whole island of Great Britain, divided into circuits or journies. London: J. M. Dent. Retrieved 22 May 2009. ^ Mawe, J. (1802). The Mineralogy of Derbyshire. London: William Phillips. Retrieved 22 May 2009. ^ Adam, W. (1843). Gem of the Peak or Matlock Bath and its vicinity. London: Longman. Retrieved 22 May 2009. ^ a b "Things to do in Buxton" (PDF). Quantifying and Understanding the Earth System. Archived from the original (PDF) on 25 August 2011. Retrieved 28 June 2009. ^ Darwin, C. (1985). The correspondence of Charles Darwin. Cambridge: Cambridge University Press. Retrieved 28 June 2009. ^ Blakemore, B.; Mosley, D. (2003). Railways of the Peak District. Great Northern Books. ISBN 1-902827-09-0. ^ "Halls in the Peak District". Peak District Online. Peak District Online. Retrieved 5 August 2018. ^ a b c "Peak District Attractions". Peak District Online. Retrieved 28 April 2016. ^ "Eyam Museum and Plague Village". Peak District Information. Retrieved 14 September 2017. ^ "Exploring Duffield & Wirksworth on the Ecclesbourne Valley Line, Derbyshire". Derbyshire Life and Countryside. Derbyshire Life and Countryside. Retrieved 23 August 2018. ^ "History of the CVR - LMS & BR Days - History of the Churnet Valley Line". Churnet Valley Railway. Churnet Valley Railway. Retrieved 23 August 2018. ^ "More about Well Dressings". WellDressing.com. Retrieved 18 June 2009. ^ "Peak District National Park: Study Area". Peak District National Park. Archived from the original on 31 March 2005. Retrieved 22 June 2009. ^ a b c "Tissington Trail". Discover Derbyshire and the Peak District. Retrieved 1 July 2009. ^ "Glossop/Longdendale Walk". Discover Derbyshire and the Peak District. Retrieved 1 July 2009. ^ "Monsal Trail". Discover Derbyshire and the Peak District. Retrieved 1 July 2009. ^ "The High Peak Trail". Discover Derbyshire and the Peak District. Retrieved 1 July 2009. ^ "Cycle hire". Derbyshire County Council. Retrieved 24 March 2015. ^ "Cycling". Peak District National Park. Retrieved 24 March 2015. 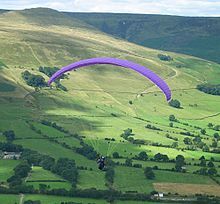 ^ "Local Activities in & around the Peak District National Park". Roaches Holiday Cottages. Retrieved 22 June 2009. ^ a b "Peak District". Trekking World. Retrieved 22 June 2009. ^ Milburn, G. (1987). Rock Climbs in the Peak District: Peak Limestone: South. British Mountaineering Council. ISBN 0-903908-26-3. ^ "Pot holing". Peak District Information. Cressbrook Multimedia. 2008. Retrieved 30 June 2009. ^ "The Romano-British Settlements". RomanBritain.org. 10 September 2010. Archived from the original on 28 September 2010. Retrieved 26 September 2010. ^ "Peak District Routes, Stoops, Pack Horse Ways, Turnpikes". Peakscan. 2008. Retrieved 22 May 2009. ^ "Longendale in the Peak National Park". PDNP Education. 2000. Archived from the original on 4 January 2006. Retrieved 22 May 2009. ^ a b c Stainforth, G. (1998). The Peak: Past and Present. Constable. ISBN 0-09-475420-9. ^ Giannangeli, M. (5 December 2005). "Peak District may be first national park to impose a congestion charge". The Daily Telegraph. Retrieved 23 May 2009. ^ "Cromford Canal". Discover Derbyshire and the Peak District. Retrieved 1 July 2009. ^ a b "Public Transport – Peak District National Park Authority". Peak District. 2012. Retrieved 3 April 2012. ^ "Peak District Quick Facts & Figures". Essential Travel Guide. Retrieved 15 September 2017. ^ "Public Transport in Derbyshire and the Peak District". Discover Derbyshire and the Peak District. 2009. Retrieved 22 June 2009. ^ "Pedal power to help residents and visitors lead more active lifestyles – Peak District National Park Authority". Peak District. 7 October 2009. Archived from the original on 7 July 2011. Retrieved 16 October 2009. ^ "Peak District National Park". ByGoneDerbyshire.co.uk. 28 January 2010. Retrieved 26 September 2010. ^ a b Moss, C. (28 February 2004). "Oops, there goes another bit of Britain". The Guardian. Retrieved 22 May 2009. ^ a b "Tourism in the Peak District National Park". Peak District National Park. 2003. Archived from the original on 31 March 2005. Retrieved 22 May 2009. ^ "Peak District National Park: Study Area – Footpath Erosion". Peak District National Park. Archived from the original on 1 September 2005. Retrieved 22 June 2009. ^ "Peak District National Park: Study Area – The Pennine Way". Peak District National Park. Archived from the original on 1 September 2005. Retrieved 22 June 2009. ^ "Take back the tracks". Friends of the Peak District. Retrieved 14 September 2017. ^ "Peak District Biodiversity Action Plan" (PDF). Peak District. October 2002. Archived from the original (PDF) on 20 July 2011. Retrieved 13 November 2013. ^ "End in sight for quarry wrangle on historic moor". Peak District. 5 September 2007. Archived from the original on 20 July 2011. Retrieved 12 September 2007. ^ Elliott, R. W. V.; Brewer, Derek; Gibson, J. (1999). "Landscape and Geography". A Companion to the Gawain-Poet. Brewer D. S. pp. 105–117. ISBN 0-85991-529-8. ^ "Pride and Prejudice by Jane Austen". Project Gutenberg. 2003. Retrieved 13 September 2007. ^ Historic England (2007). "Peveril Castle (309632)". PastScape. Retrieved 12 September 2007. ^ Ousby, I. (1993). Ousby I, ed. The Cambridge Guide to Literature in English (2nd ed.). Cambridge University Press. p. 734. ISBN 0-521-44086-6. ^ a b c d "Peak Film & Literature". Peak Experience. Archived from the original on 5 September 2007. Retrieved 12 September 2007. ^ Brontë, C. (1996). Jane Eyre. Penguin Books. p. 526. ISBN 0-14-043400-3. ^ Barker, J. (1995). The Brontës. Weidenfeld & Nicolson. pp. 451–453. ISBN 1-85799-069-2. ^ Potter, E. (1892). "Dinting Vale Printworks cotton sample pattern book". Spinning the Web. Manchester City Council. Retrieved 28 June 2009. ^ a b "Peakland Writers". Peakland Heritage. 2008. Archived from the original on 7 November 2007. Retrieved 12 September 2007. ^ "Crichton Porteous – Derbyshire Writer". About Derbyshire. 3 June 2007. Retrieved 12 September 2007. ^ "Year of Wonders". GeraldineBrooks.com. 2007. Retrieved 13 November 2013. ^ "Berlie Doherty: novels". BerlieDoherty.com. 2003. Archived from the original on 2 August 2007. Retrieved 12 September 2007. ^ "Tales of Terror and Mystery by Sir Arthur Conan Doyle". Gutenberg. 2008. Retrieved 13 September 2007. ^ "The Adventure of the Priory School". Camden House – The Complete Sherlock Holmes. 1998. Retrieved 13 September 2007. ^ "Stephen Booth – New Books". StephenBooth.com. Retrieved 12 September 2007. ^ "Novel – In Pursuit of the Proper Sinner". Elizabeth George Online. Retrieved 12 September 2007. ^ "Filming locations for The Dam Busters". Internet Movie Database. 1990. Retrieved 13 September 2007. ^ "Filming locations for Pride and Prejudice (1995)". Internet Movie Database. 1995. Retrieved 12 September 2007. ^ "Filming locations for Pride and Prejudice (2005)". Internet Movie Database. 2005. Retrieved 12 September 2007. ^ "Film & Photoshoots". Haddon Hall. Retrieved 22 June 2009. ^ "Filming locations for Peak Practice". Internet Movie Database. 1993. Retrieved 12 September 2007. 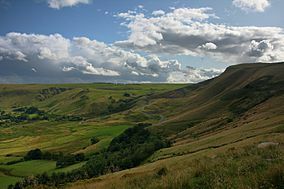 Wikimedia Commons has media related to Peak District. Wikivoyage has a travel guide for Peak District. Parentheses denote year of establishment as a National Park. An area with ‡ has similar status to a UK National Park. Areas marked † are proposed. This page was last edited on 17 April 2019, at 12:22 (UTC).